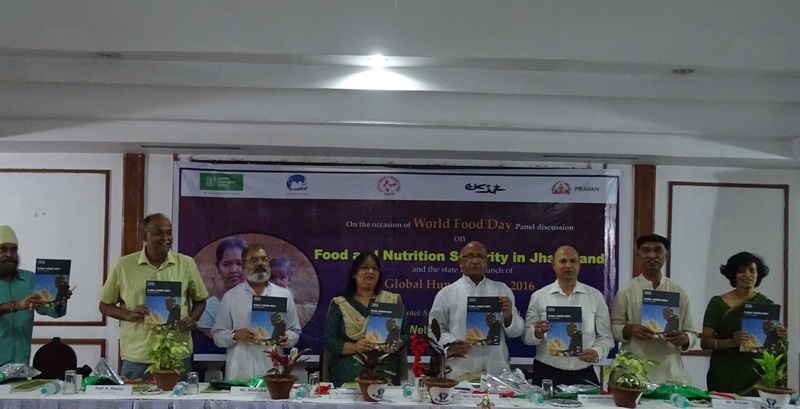 Welthungerhilfe India along with its partners in India’s states of Jharkhand and Madhya Pradesh has launched the GHI 2016 at the state level. 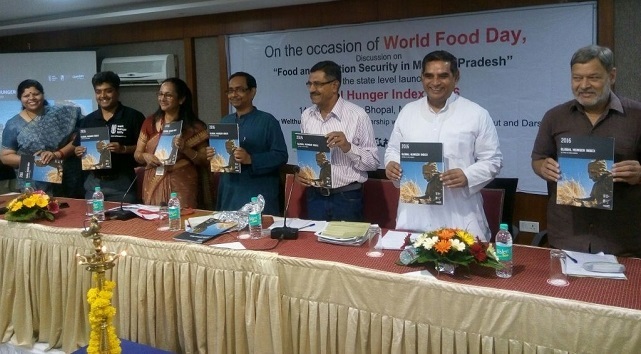 The events in Bhopal and Ranchi came ahead of World Food Day on October 16th and followed the international launch of the report in Brussels, Belgium on October 11th, 2016 by the International Food Policy Research Institute (IFPRI), Welthungerhilfe, and Concern Worldwide. 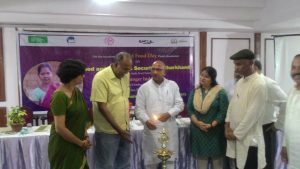 Both the events (in Madhya Pradesh and Jharkhand) were followed by panel discussions on Food and Nutrition Securi ty situation in the two states. 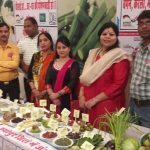 In Jharkhand, the event was inaugurated by Hon’ble Minister for Parliamentary Affairs & Food, Public Distribution & Consumer Affairs, Shri Saryu Rai. Addressing the audience during a panel discussion, he said, “Political will, technical skill and farmers’ zeal are very important to increase food production and address food insecurity.” Describing GHI as an eye-opener, he said, “We must work at the ground level to end hunger.” “For Jharkhand, we must set a zero hunger target for 2020 instead of 2030,” he added. 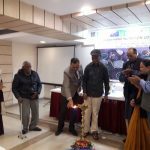 Representatives of several national and international development organisations, as well as regional media organisations, attended the launch in Ranchi, which was organised in collaboration with partner organisation LEADS, Abhivyakti Foundation Ekjut and Pravah. Economist Ramesh Saran spoke about the importance of Micro-mapping and said, “planning and budget allocation must be based on targeted malnutrition pocket and families then only we can eradicate stunting and wasting in children.” Speaking on crop diversification, Jatashankar Choudhary, Director, Department of Agriculture, Govt. of Jharkhand, said, “Rainwater harvesting is very important to improve crop diversification.” He also stressed on increasing the focus on the production of pulses and oilseeds and on fallow cultivation. 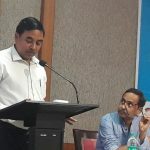 Dr Madhulika Jonathan, Chief of Field Office, UNICEF, Jharkhand , A K Singh, Director, LEADS and Krishnakant, Director, Abhivyakti Foundation were among the other speakers at the dais. Earlier Welthungerhilfe’s Country Director, Nivedita Varshneya presented the findings of the 2016 GHI report for the audience, particularly in the context of India. 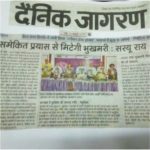 In Madhya Pradesh’s capital Bhopal, the event, organised by Welthungerhilfe’s partners Samarthan, Ekjut, Mahatma Gandhi Sewa Ashram and Darshna Mahila Kalyan Samiti, brought together several key state level and international development partners and representatives from the local media. At the event, Subhankar Chatterjee, Head of Programmes, Welthungerhilfe gave an overview of the GHI 2016, which was followed by an in-depth discussion on food and nutrition security situation across the state. 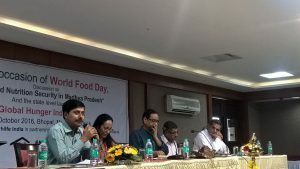 While activist Sanjay Singh of Parmarth talked about the importance of pulses for higher food production and better nutrition as well as the promotion of local food systems, nutrition expert Dr Anita Singh emphasized the importance of having a food atlas, containing details of locally available food, including uncultivated and forest food, their nutrient values and cooking style. Development activist Rakesh Diwan, said it was important to compare food production, supply and food systems with GHI findings. Both Jharkhand and Madhya Pradesh are among the states with high malnutrition rates, despite efforts to reduce the proportion of underweight and stunted children over past years. According to the Census of India’s Clinical, Anthropometric and Biochemical (CAB) survey conducted in 2014, in Madhya Pradesh, nearly 51 per cent children are stunted, while almost 40 percent are underweight. While in Jharkhand, 51% children are underweight, 53.4% children are stunted and 19.9% are wasted (source: Rapid Survey of Children, UNICEF & Govt of India, 2014). 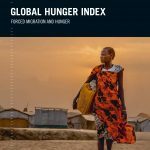 The GHI, now in its 11th year, ranks countries based on four key indicators: undernourishment, child mortality, child wasting and child stunting. The 2016 report ranked 118 countries in the developing world, almost half of which have “serious” or “alarming” hunger levels. India currently has the fifth highest GHI score in Asia— better than only Afghanistan, Timor-Leste, Pakistan, and North Korea. Though India has considerably improved its global hunger index score to 28.5 in 2016 from 38.5 in 2005, the progress has been uneven. By contrast, Brazil, Russia, China and South Africa, all of whom share the BRICS high table with India, have a single-digit score. Although the country of over 1.2 billion people has managed to reduce instances of stunting among children by nearly half in the past decade compared to the previous one (IFPRI 2015), India remains home to one-third of the world´s stunted children (UNICEF et al. 2016). It, therefore, falls into the ‘serious’ category in this year’s GHI. India’s 15.2 percent of the population is undernourished, meaning that they do not receive enough calories per day, while 15.1 percent of children under five are wasted (low weight for their height), reflecting acute undernutrition. 38.7% of India’s children under five are stunted (low height for their age), reflecting chronic undernutrition 4.8% of children die before the age of five. The GHI score for the developing world as a whole is 21.3, which is at the low end of the “serious” category. Regionally, Africa South of the Sahara has the highest hunger level, followed closely by South Asia.